Manicani Island located in Guiuan, Eastern Samar was an icon of devastation after Super Typhoon Yolanda (Haiyan) made its landfall on the island on the 8th of November, 2013. TAO-Pilipinas, along with seven Non-Government Organizations (NGOs) from different sectors specifically, coastal resource management; renewable energy, water resources and communications; infrastructures (shelter and evacuation centers); integrative health; sustainable agriculture and land management; advocacy, networking, and capacity-building; and community-based disaster risk reduction and management (CBDRRM) were invited to work under Project Pagbangon by Philippine Misereor Partnership, Inc. (PMPI). 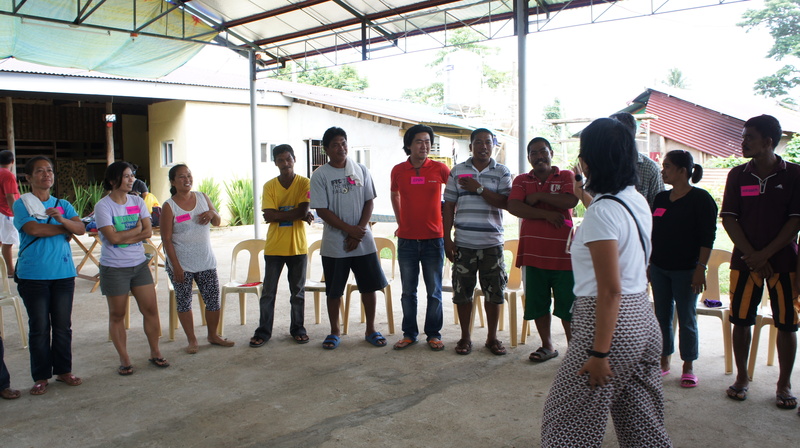 Project Pagbangon focuses on rehabilitating and developing the partner communities in Panay and Eastern Samar who were survivors of Super Typhoon Yolanda. 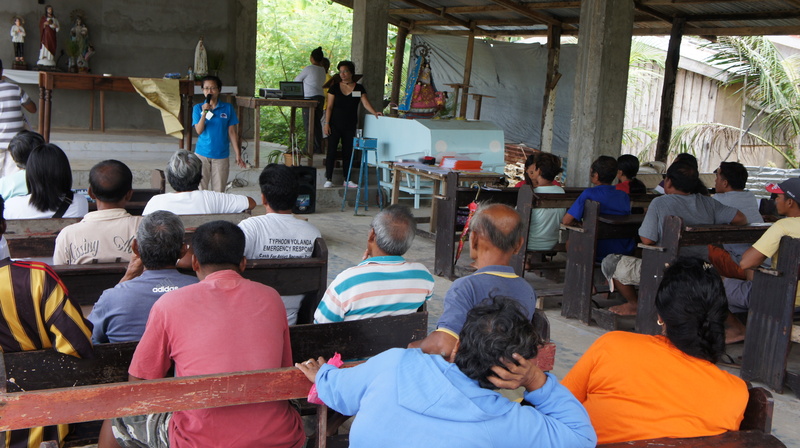 TAO-Pilipinas, as the sole partner of PMPI for the Infrastructure Component was assigned to design and construct 120 sustainable shelters (40 in Manicani Island and 80 in Homonhon Island) and 12 evacuation centers (4 in Manicani Island and 8 for Homonhon Island) for twelve barangays not only for Manicani Island but also for Homonhon Island, another island in Guiuan, Eastern Samar affected by Super Typhoon Yolanda. 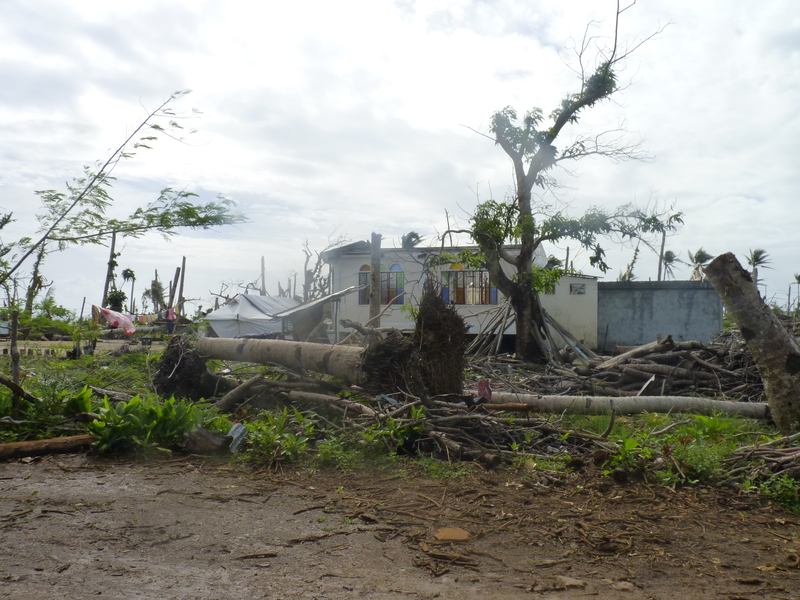 The sustainable shelter assistance in Manicani Island was completed with the help of Terre des hommes-Germany (Tdh-G), Christian Aid (CA), and PMPI. 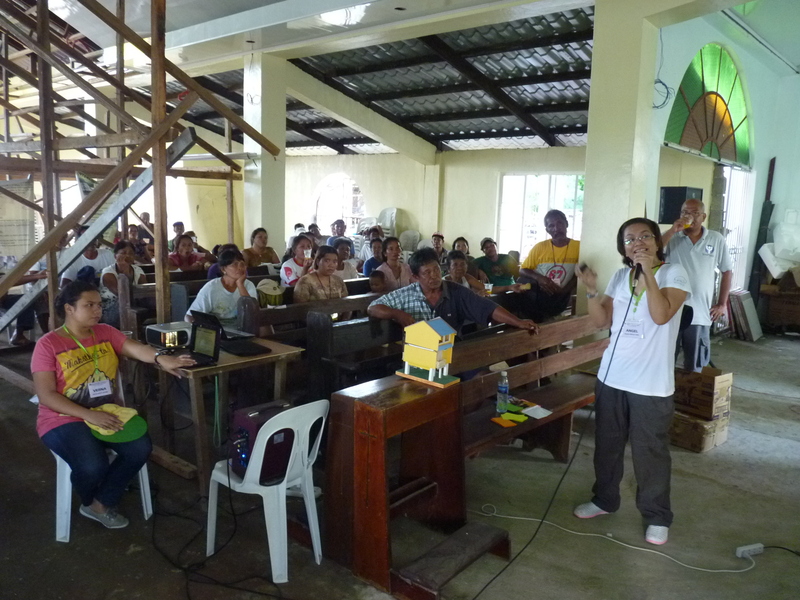 The said project aimed to provide 40 sustainable shelters—also disaster-resilient, culturally sensitive, and cost effective—to select household beneficiaries from the four barangays of Manicani Island namely: Barangay Buenavista, Barangay Banaag, Barangay San Jose, and Barangay Hamorawon. 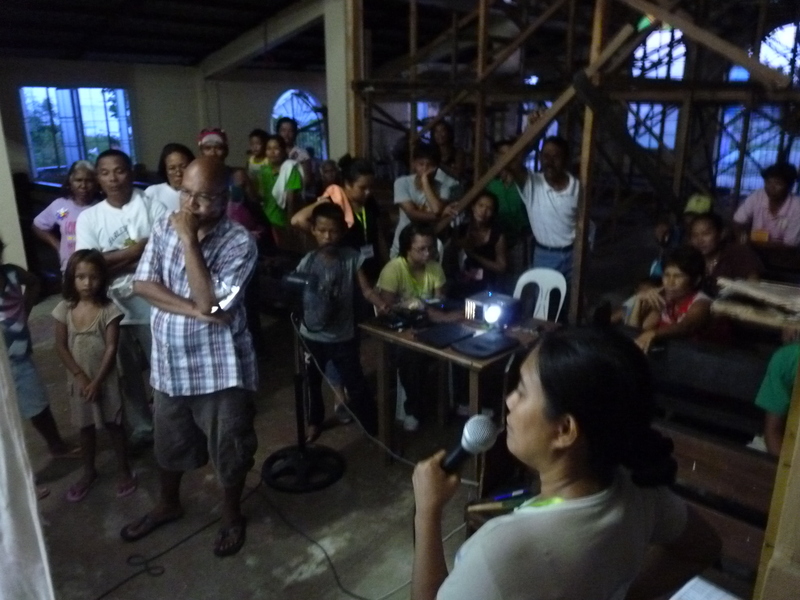 Primary assessment was conducted by Arturo Tahup, community organizer of Tdh-G, to the residents of the island. 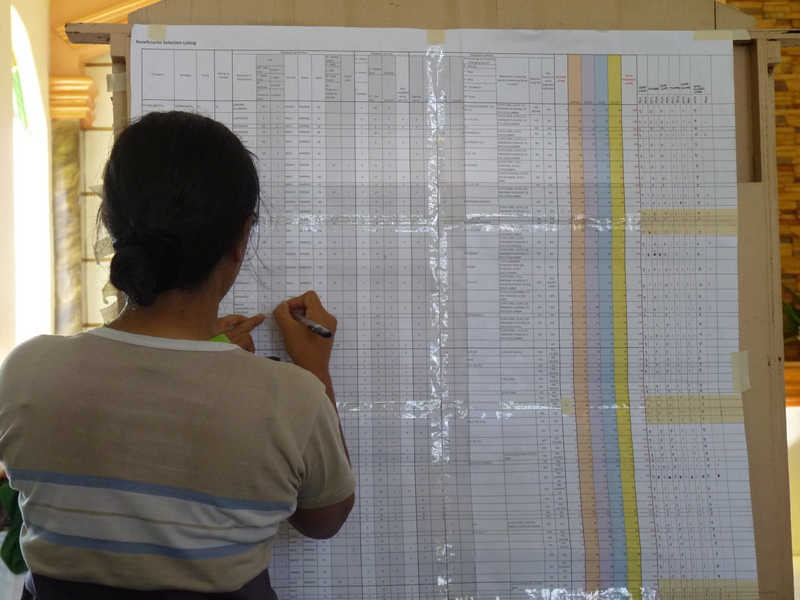 He gathered the shortlist of potential beneficiaries (82 households) provided by the barangay, all of which haven’t received any shelter assistance from other organizations or institutions. A multi-sectoral team formed from among the potential beneficiaries in the island acted as an assessment committee to validate and ultimately select forty (40) beneficiaries based on the criteria provided (as shown in the table) by evaluation and validation processes. 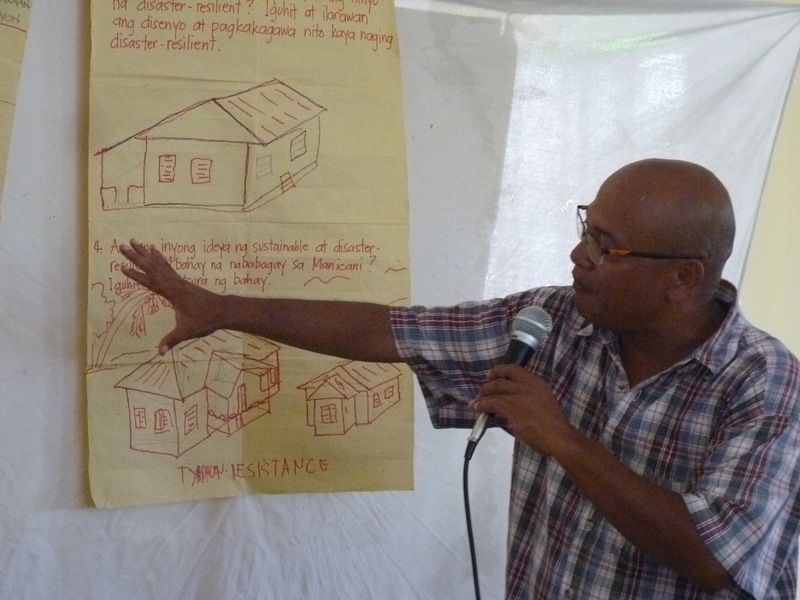 A mapping of the housing sites of selected beneficiaries was conducted by geologists to determine the risks present and whether the site is within the safe zone, the low-risk area, the medium-risk area, or the high-risk area. 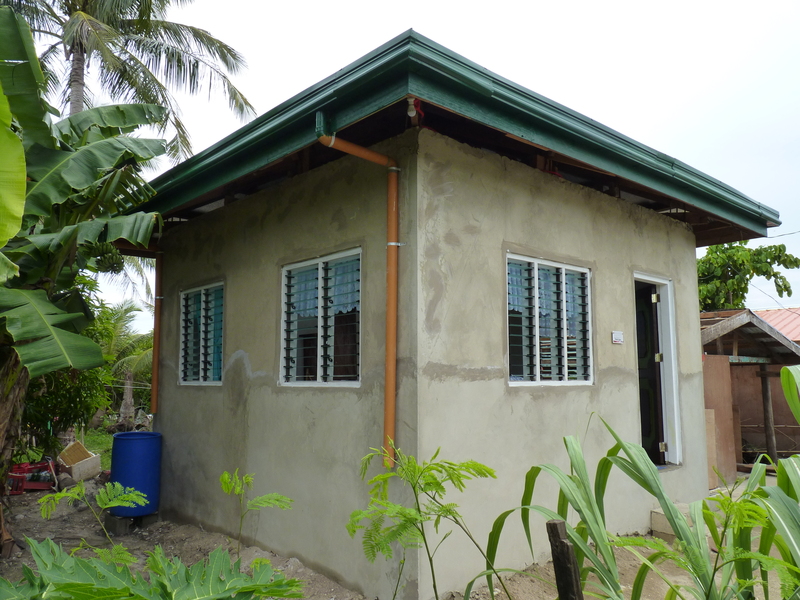 Beneficiaries located in high-risk areas (water front) had to find another site to qualify for the project. In the end, sixteen (16) beneficiaries were able to provide a low-risk site while the rest settled on a medium risk area. 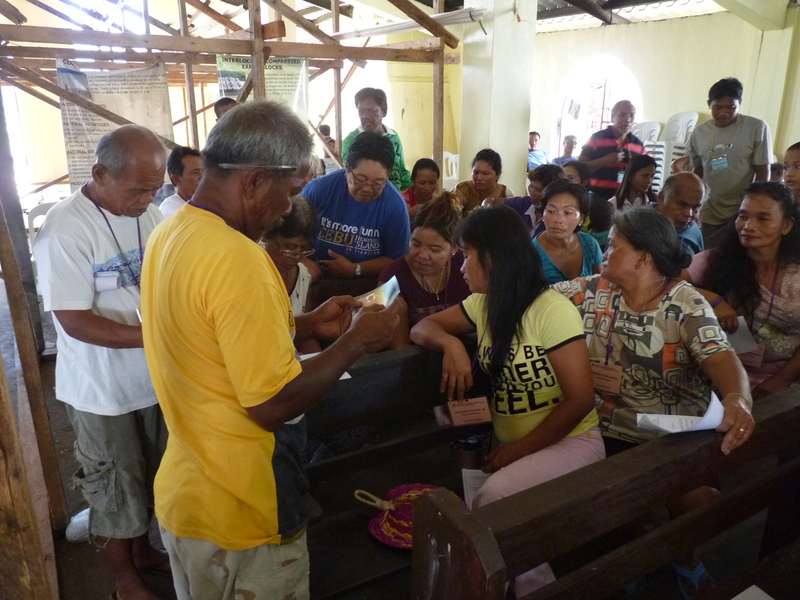 On October, 2014, a few days before the final list of beneficiaries were released, a two-day sustainable and disaster-resilient settlements planning and design workshop was conducted by TAO-Pilipinas participated by the 82 shortlisted household beneficiaries to increase awareness on sustainable design and disaster resilient construction and to guide them in the design and construction of their permanent house. of budget limitation, the area was finally reduced to 25 sqm with a symmetric plan (5m x 5m). Houses located in safe zones were built on ground while those located in low-risk or a medium-risk area, were required to raise their floor level from 0.60m to 1m above the ground to protect the household from potential floods. 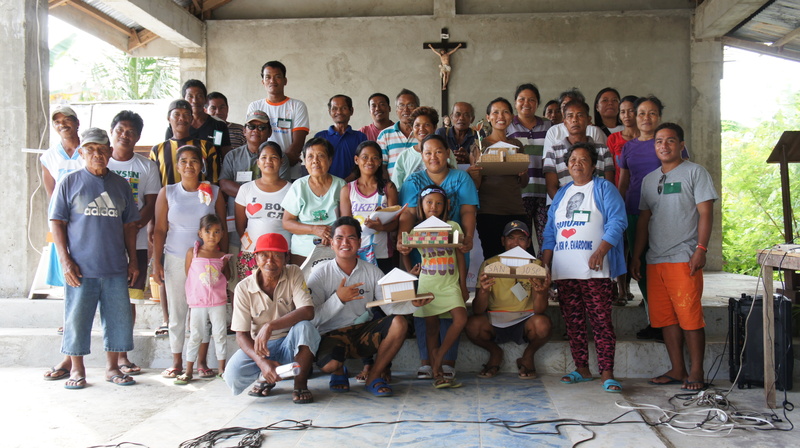 The beneficiaries agreed to shoulder the expenses for excavation of foundations and a portion of transportation of construction materials from the mainland of Guiuan as their counterpart. They were tasked to choose their own contractor. The contractors were paid weekly depending on the progress made in the construction, assessed by a construction supervisor, with two foremen, in the island hired by TAO-Pilipinas. Construction started March, 2015 and a turnover and house blessing was held on the 13th day of September, 2015 even though, then, there were still nine (9) shelters that needed minor finishing and three (3) shelters which still has to go through major construction, all of which were completed by December last year. 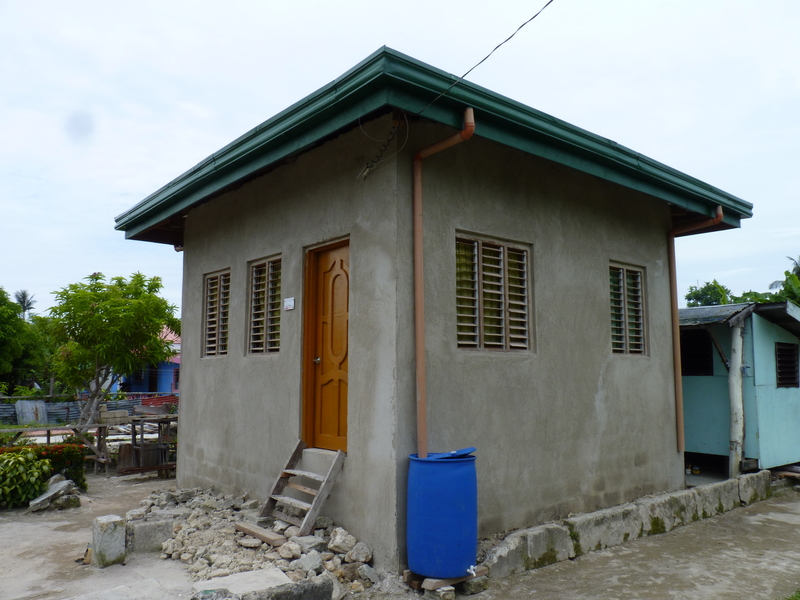 Some beneficiaries also decided to add an extension in their house after attending a post-construction workshop on house extension conducted by TAO-Pilipinas. TAO-Pilipinas, Tdh-G, and CA hosted a reflection session, the day after the turnover, with the beneficiaries to see what they have learned in the duration of the project and also to hear their thoughts about it. The reflection session was facilitated by Rosanna Quesada Palm is the current Executive Director of Youth Advocates Through Theater Arts (YATTA) and is also a member of Philippine Educational Theater Association (PETA). The beneficiaries were able to remember the important components of a sustainable shelter like having hip roof and installing storm shutters among others. Some beneficiaries confessed that never in their life would they have dreamed of living in a concrete house, complete with kitchen and bathrooms they were grateful to be a beneficiary of the project. On the other hand, some were still hoping to keep their previous houses near the shoreline to which Arch. Arlene Christy D. Lusterio, Executive Director of TAO-Pilipinas, explained that aside from going against their signed agreement, maintaining their previous homes would be counterproductive as the purpose of the project is to keep them from harm’s way. 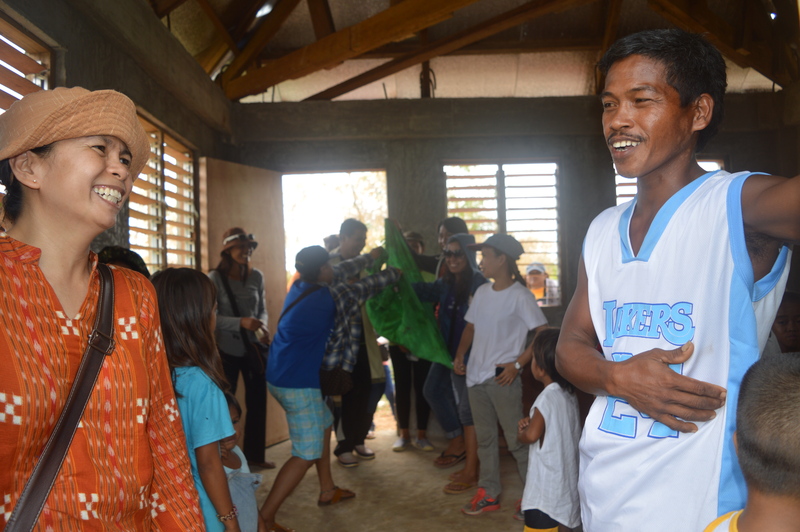 Overall, despite facing some considerable hindrances on the field, the sustainable shelter assistance project in Manicani Island was a success. Currently, the sustainable shelter assistance project in Homonhon Island is set to start early this year while the evacuation centers on both islands are on the process of land acquisition. 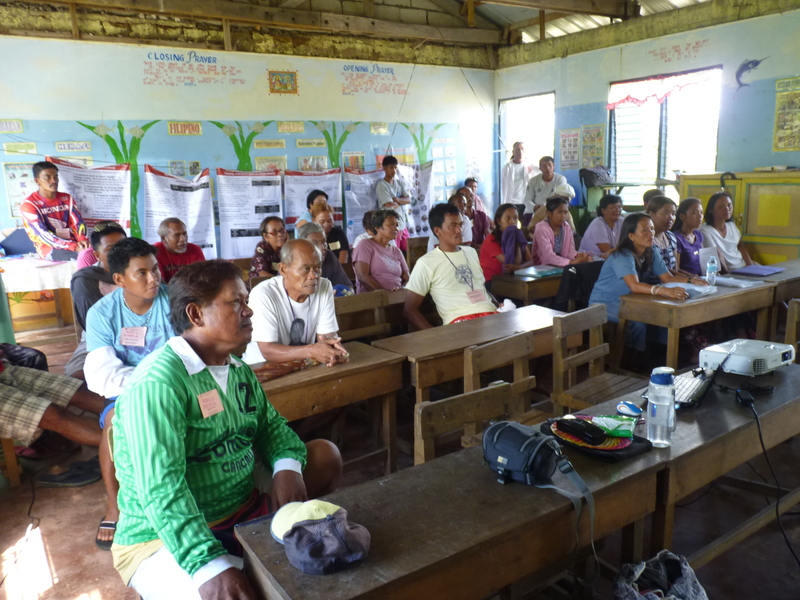 This entry was posted in Human Settlement and Environment, News, Recent Stories and tagged christian aid, eastern samar, guiuan, manicani, pmpi, project pagbangon, sustainable shelter, terre des hommes germany. Bookmark the permalink.